Each Guarantee is as follows: 20 years for 316 Liner, 25 Years for 316/904 Liner and 35 Years for 904/904 Liner. 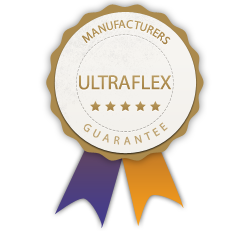 Thank you for installing one of our Ultraflex Flexible liners. We hope you enjoy many years of warmth and comfort from your installation. To prolong the life of your appliance please ask your Installer about moisture metres, stove thermometers and chimney cleaning logs. It is recommended that you fit an audible carbon monoxide alarm - these are available from online store here or from registered HETAS Installers. To register your installed liner, you will need your sales order number, HETAS installers details of your local building control. You cannot proceed with the registration process without this important information.